Anton Mizerak: keyboards, harmonica, Tibetan bowls & ambient vocals. Free download of the first part of the opening piece. 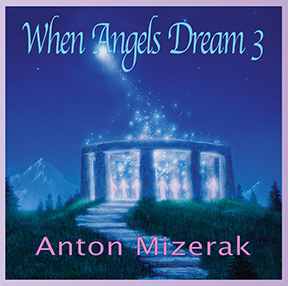 63 minutes of healing and deep relaxation music, the culmination of the "When Angels Dream" series. Available for sale before Christmas 2018. Opening clip Anton Mizerak: keyboards & Tibetan bowls; Manose: bamboo flute; Corbin Keep: cello; Micheal Mandrell: guitar. Finally, ten years after the release of When Angels Dream II, When Angels Dream III is the fruition of years of maturation of Anton's composing, producing, recording and perforiming skills and the virtuosity of Nepali flute meastro Manose Newa and Canadian cellist Corbin Keep, augmented by the best supportive team of Micheal Mandrell and Laura Berryhill.